Organisations are communities. Increasingly the leaders of those communities are drawing on the services of psychologists to help them realise the potential of their “human capital”. What do these business psychologists do to assist in the identification, motivation and development of the talent that employees bring into their communities? The authors, all Principal Members of the Association of Business Psychologists, are experienced and qualified professionals who candidly share their experiences and learning derived from those experiences. They provide case studies and examples from real interventions, they ask provocative questions about conventional thinking and practice and they explain the models that help them make sense of the complex organisations in which they operate. Business Psychology in Practice takes us on an excursion behind the scenes in organisations. This book will be of interest to consultants, those who commission their services and anybody wrestling with ‘people issues’. Pauline Grant is a Principle Member of the Association of Business Psychologists. Chapter 1 Introduction. (Pauline Grant). Chapter 2 What Clients want. (Charles Mead and Rachel Robinson). Chapter 3 Make or Break - Structuring The Initial Meeting. (Anne Hamill). Chapter 4 The Consulting Project lifecycle. (Siobban McKavanagh). Chapter 5 The Consulting Relationship. (Mark Loftus). Chapter 6 Values-based Consultancy. (Sue Clayton and Trevor Bentley). Part 2. The organizational Landscape. Chapter 7 Introduction. (Pauline Grant). Chapter 8 A Fairy-ish Story. (Pauline Grant). Chapter 9 Avoid Being Your own worst Enemy! (Malcolm Hatfield). Chapter 10 The Political Terrain. (Kylie Bains). Chapter 11 Team Development - a Case Study Based on 'appreciative Inquiry'. (Sarah Lewis). Chapter 12 Introduction. (David Thompson). Chapter 13 Themes of Measurement and Prediction. (David Thompson). Chapter 14 Assessment Centres Getting More Bang for Your Buck. (Simon Brittain and Rob Yeung). Chapter 15 Technology and Large-volume Assessment. (James Bywater and Helen Baron and Howard Grosvenor). Chapter 16 Practical Issues in Running International assessment and Development Centres. (Helen Marsh, Penny Markell, Ellen Bard, Mark Williams and James Bywater). Chapter 17 High-potential Talent Assessment. (Maria Yapp). Chapter 18 Assessment in Organizations at The Crossroads,. (Malcolm Hatfield). Chapter 19 Introduction. (Sarah Lewis). Chapter 20 Releasing Talent Across an Organization. (Kate Oliver and Shane Pressey). Chapter 21 Teams.Systems Within systems. (George Karseras). Chapter 22 Unleashing Leadership and Learning Within an International Bank. (Ellie Boughton, Michael Burnett, James Bywater and John Mahoney-Phillips). Chapter 23 Releasing Talent Through Coaching. (Sue Clayton). Chapter 24 Why Chief Executives Hire Coaches. (Janey Howl). Chapter 25 A Case history of Releasing Talent Through Coaching. (Christopher Ridgeway). Part 5. Business Psychology applied to Systems. Chapter 26 Introduction. (Pauline Grant). Chapter 27 Best Practice Performance Management in today's Commercial Reality. (Nadine Burton). Chapter 28 The Psychology of Customer Relationship Management. Jo Hennessy and Rod Vincent). Chapter 29 Improving Options for Managing Risks to Business and Employee Health. (Kieran Duignan). 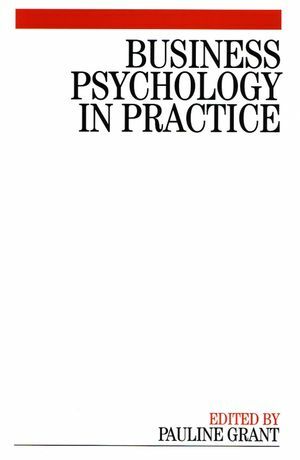 Chapter 30 Psychological Principles and The Online Evaluation Environment. (Joanne Share-Bernia). Chapter 31 Introduction. (Pauline Grant). Chapter 32 Organizational Change - an Historical overview. (David Thompson). Chapter 33 Using Culture and Climate Profiling to Drive Organizational Change. (Paul Brewerton). Chapter 34 Designing and Implementing Strategic Change Programmes. (Roy Drew). Chapter 35 The Role of Psychology in Implementing Large-scale Change With Diverse Cultures. (Sylvana Storey). Chapter 36 'Why Won't They do what we Tell Them?'. (Richard Plenty). Chapter 37 Business Psychology - The key Role of learning and Human Capital. (David A Lane and Amin Rajan).